This pattern is part of the Wonderland Collection. 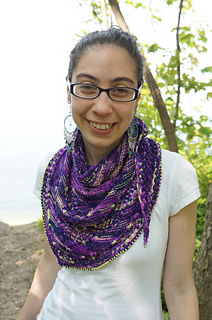 The entire 6-shawl collection can be pre-ordered for $20 by clicking the e-book link at the top right. The patterns will be added over the course of the Summer and Fall 2016. All patterns are designed to use a single skein of sock yarn. This design is worked in a single skein of a limited edition colorway that can be found at Jimmy Beans Wools. This pattern utilizes a single skein of hand dyed variegated yarn. Every effort is made for the skeins to be as similar as possible, however, do keep in mind that there will be variations between skeins. The same colors are used in each, but it is inevitable that one skein may have a slightly higher ratio of one color than the next one does. Exact replicas are nearly impossible with hand dyeing. And thus is their charm! The shawl shown uses 3 colors of beads. You may use 1 color, 4 colors, or none at all! Want to KAL?! You can find the thread HERE. Slip 2 stitches to cable needle and hold in front. P1 then k2 from cable needle. Slip 1 stitch to cable needle and hold in back. k2 then p1 from cable needle. I purchased the entire collection, but not all the designs are listed. What now? When you purchase the entire collection before all the patterns are released it’s considered a pre-order, or advance order. As each design is released you will automatically receive an email and notice on Ravelry that the pattern is ready.